I finally pulled the trigger and got the Panono! Am I experiencing buyer’s remorse or were my expectations exceeded? Here are my first impressions. 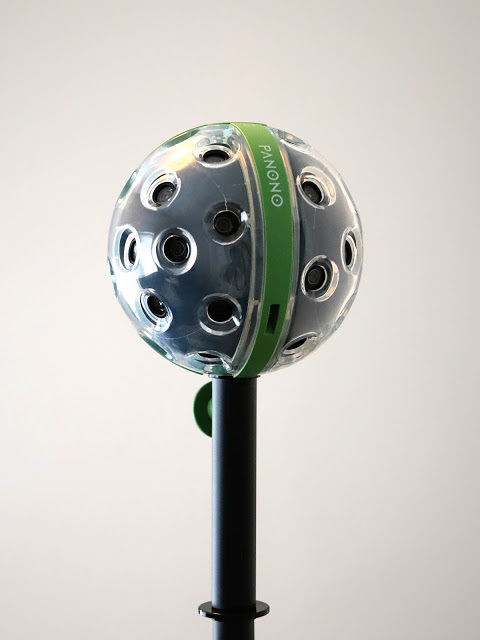 The Panono is a ball-shaped 360 camera with 36 lenses. It can capture 108-megapixel photos, which had been the highest resolution for an all-in-one 360 camera for a long time, and overtaken only recently by the Staro (136 megapixels). I’ve always wanted a Panono. From sample photos, I found its image quality to be amazing not just for its resolution but also its dynamic range. But I was intimidated by the stitching. I knew that there was no in-camera stitching, and no stitching app on the phone. Instead, its photos would have to be stitched through Panono’s cloud. I felt like I had little control. I also heard some say there’s a subscription fee for the cloud (I later found out it is not true, unless you want to remove the logo when viewing on their page.) Finally, not too long ago, Panono raised their prices by around 33% to $1999 USD plus shipping. Those things made it harder for me to decide to get it. The thing with Panono is, it doesn’t have any real competition. Staro would have been nice but they don’t seem to answer emails or indicate how to purchase their camera. Either you need high-resolution 360 photos in one shot or you don’t. 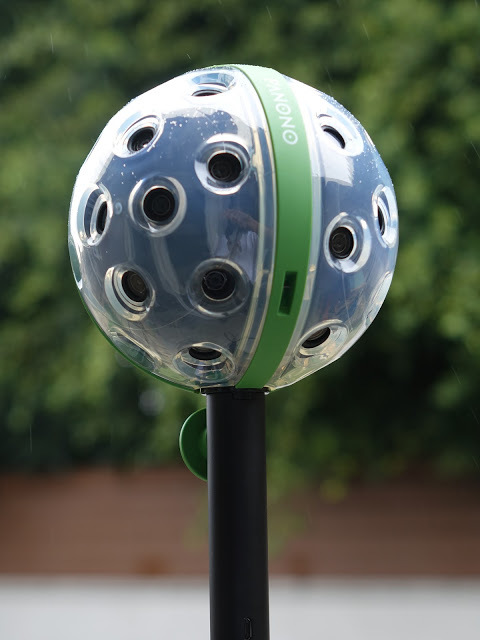 And if you do, Panono is still the only 360 camera that does that and is readily available. So I got one from B&H Photo. The Panono came in a simple cardboard box with no frills. There were instructions, a Micro USB cable, and then the Panono itself. The Panono was smaller than I expected. It is about the same size as a shot put for men, 11cm in diameter. It is neither heavy nor light. It weighs about as much as I thought. The body is covered with polycarbonate plastic and feels very solid and high quality. I also got two accessories that are really must-haves for the Panono: the tripod adapter and a selfie stick. The Panono doesn’t have any kind of tripod attachment and its unusual shape makes it difficult to find a holder for it. The tripod adapter attaches to the Panono’s micro USB port and locks with a quarter turn. It is pretty much the only way to attach the Panono to a standard tripod or monopod. The tripod adapter is also handy because it has its own Micro USB port, which can be used for charging. I’ve been leaving my tripod adapter attached. The selfie stick is a convenient way of triggering the Panono. Like the tripod adapter, the selfie stick connects via the micro USB port. However, it does not have another Micro USB port, unlike the tripod adapter. 1. Download the Panono app to your iOS or Android device. Create an account on Panono. 2. Turn on the Panono. 3. Connect your smartphone to the Panono’s Wi-Fi signal. Connecting to the Panono’s Wi-Fi was totally painless unlike the Nikon Keymission 360. 4. On the Panono app, press the shutter to take a shot. (There are settings for manual exposure and white balance). Within a few seconds, you’ll get a rough preview of the photo. You can either download the photo from the camera to your phone, then upload from your phone to the cloud, in separate steps, or tap the new “move to cloud” option which does both. 5. Normally, the app won’t upload the photo until you disconnect from the Panono. However, if you are ok with uploading via your phone’s wireless service, it will begin uploading to the cloud. When you upload the photo, there will be a countdown estimate of how long it will take to finish the upload. Uploading is generally quick — only a few seconds (of course this depends on your internet speed). 6. Once a photo is uploaded, the Panono servers will process your photo. It will take about 10 minutes. The app shows the estimated time remaining. When processing is done, the stitched photo will appear on your Panono directory. Unfortunately, my first test shot was horrible. I took it at our small home office and the stitching was quite bad. Literally, it was the worst stitching I’ve seen. Interesting abstract piece. It’s a crop from my first Panono shot. That puzzled me because posted samples from the Panono looked like they had decent stitching. It turns out that the minimum shooting distance is 1 meter (due to parallax), according to the tech support rep I contacted. Obviously, anyone who has shot with 360 cameras even for a little while knows about parallax. But I didn’t expect the minimum distance to be so large. In fact, in practice, it seems even larger than that, although I haven’t figured out the limit. Panono’s creator Jonas Pfeil has said in Panono’s forums that for the best stitching, Panono needs many distinct features that it can use as control points. 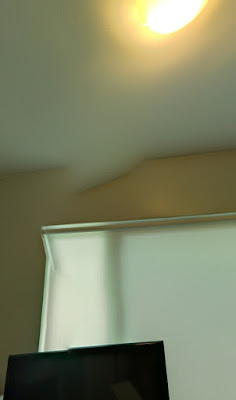 The worst case scenario would be a room with white walls, which would make it difficult for the computer to identify control points. After I got the hang of taking some samples, I ventured to try Panono’s famous “Throw” mode. When you throw the Panono into the air, it will take a photo at the apogee. It turns out this doesn’t even require any switches. The camera just has to be turned on. It will automatically detect when it is thrown. The only limits are: the Panono must not rotate or spin too much in the air, and the minimum throw height is 1.5 meters. In the real world, throwing it without spinning takes a lot of practice. I tried it out at a playground with rubber mulch (just in case I fail to catch it). Out of 10 attempts, perhaps only 1 succeeds for me. Maybe I’ll get better in the future. Overall, I’m pleased with the Panono. The quality is about as good as I expected. It’s sharp, and has very good dynamic range. With the HDR option, the dynamic range becomes fantastic, and the combination of exposures looks realistic, not “HDR-ish.” There is very minimal chromatic aberration, a little bit of flare, but no major problems. Stitching is good but usually not perfect. It’s amazing that they can stitch 36 photos together and have it look relatively smooth. However, there are often stitching errors where you would not expect, such as a straight line having a broken segment. I was surprised by the Panono’s usability. It’s more usable than I expected. It’s reasonably portable and easily fits in my JJC bag with the tripod adapter attached. The selfie stick won’t fit in my bag, but it’s fine I guess. Stitching takes a few minutes but the process from shooting to getting the photo uploaded is very easy and painless. – I was surprised that their app had no self-timer. I wish they would add a self-timer. – I also could not download my own stitched photos from the Panono app. Instead, I would need to go to Panono website to download those photos. It would be so much more convenient if you could download them from the Panono app. – It’s nice that you have manual exposure. I wish they could add exposure compensation to their auto exposure. – Lastly, I hope they improve their stitching algorithm even further. Here are more recent samples. I look forward to taking more shots with the Panono. I’ll post a review when I’ve had more experience with it. Panono is $1999 plus shipping when purchased directly from Panono, but it’s also available in the US from B&H Photo, where it is currently $1999 with free shipping and free accessories (the tripod adapter, selfie stick, carrying case, and messenger bag). Thanks for the initial review. I enjoyed reading that. Thanks Rich! Stay tuned – tomorrow I will be posting a video of the Panono in action! I was close to buying a Panono. The deal killers for me were uploading to the internet via phone rather than stitching on my Mac computer, and the stitching errors – particularly indoors where a market exists for real estate work… I am waiting for the next gen of high res 360. Hi Steve. Yes it's fantastic for outdoors but seems hit-or-miss indoors. But I've seen some really good Panono shots indoors even in tight spaces. I'll try to see what I can do with it indoors. Looking forward to it, Mic. Steve, I agree with you on the two points you've made. I, personally, like having as much control over the stitching as possible. Hi Mic any idea what the battery life is? The price answer is easy… too much 😀 https://shop.panono.com/#/en at least for me, because I would use it for fun only. Hi Rev. F.! You're right — if only used for fun, it is quite expensive and to be honest, probably overkill. Jonas here, from Panono. If you want to stitch yourself you can do that as well. You can download the unstitched images via USB. Hi Jonas. Thank you very much for clarifying that. Is there a 3rd party stitching software that you would recommend for the Panono? Our customers have been using Autopano or PTGui for example. The pictures can be seen at: http://www.pbs.org/mercy-street/360/photos/ and I doubt I could have achieved this with any other piece of tech. The Panono was great for how quick it could take pictures, great resolution and fairly decent low light performance… noisy but ok with Neat Video denoising. Only issue is more with bright light and clouds getting overexposed even at fastest shutter/ISO. HDR is ok but would be nice to have more controls on the brackets (it's settings are vaque but basically I think it's +- 1 stop) and perhaps controls on the post blend. APG does work and I did try downloading some raw image files to use in APG but it's a bit complex to get a template and for HDR to get files named correctly for Autopano to recognize the stacks. Hi Mark! Wow thank you very much for that very helpful perspective from an experienced Panono user! I really appreciate it! Great post. im super tempted to pick up the Panono for StreetView tours, but the interior stitching problems seems like a potential problem.. the detail level though is amazing.. blows the Theta V away. BTW> LOVE the pool shot, best part, looking down and seeing the guy with a slightly nervous look catching the camera 🙂 Well done. Thank Bo. Yes when you see the Panono quality, all the objections about price, cloud stitching etc. etc. fade away 🙂 As for street view, it seems kind of overkill unless for a paid client perhaps. I noticed that my panono photos on street view don’t necessarily get more views than those with a consumer 360 cam. but I gotta say, the personal gratification when seeing the output is worth something also. The ThetaV vs my nikon FF/fisheye spherical files, there are just so much more punch in the details like leaves and texture. the ThetaV kinda leaves everything a slight mush compared ha ha. I realize the full-frame files end up in the same ballpark as the Panono around 15,000 to 20,000 pixels wide. so clearly thats a big part of the trick to have a beautiful file. *been shooting commercially since 1995ish just now looking at 1-click solutions. *also makes me think that we really need to see 8K video save before we get a truly beautiful video playback experience. Hi Bo. I’m curious what an experienced panorama shooter like you would think of the Panono or the Xiaomi. There’s a pano shooter who tried the xiaomi and he has been using it for client work. Thats a pretty good question really. The Panono have a huge edge because of the many cameras, it deliver a much more consistent file, with crisp rendering all the way across the file because it don’t deal with edge of the sphere issues. What do I think about them for shooting? Im surprised that Im getting away with fairly good results from the ThetaV, and would say that for some customers its probably the perfect tool to meet a price point for a tour. (low price). Don’t think I would do a paid tour job for the hyatt using the Theta, and also probably not the Panono. The Theta color and resolution simply is not there for that. The Panono color and resolution is way within their expected target, BUT its a bit unpredictable, its just not easy to tell the Director of Photography that your cool “toy” just was not in the mood to stitch today.. 🙂 so when you are looking at commercial higher-lever content, I would probably still shoot with a spherical lens on my Nikon. Or with the good-olde-PanoScan and same lens. that camera is still hard to beat. for a golf course the Panono probably would rock. with enough distance to not worry about stitch problems.